We’d love your help. Let us know what’s wrong with this preview of Left Turn by Tim Groseclose. Among his conclusions are: (i) all mainstream media outlets have a libera Dr. Tim Groseclose, a professor of political science and economics at UCLA, has spent years constructing precise, quantitative measures of the slant of media outlets. He does this by measuring the political content of news, as a way to measure the PQ, or "political quotient" of voters and politicians. To ask other readers questions about Left Turn, please sign up. In a different universe, a book like this one would never have been written. Not because it’s in any way false (it’s as far from it as it is intellectually possible), nor because its subject matter is uninteresting or boring. No, this kind of book ought not to have been written because in a perfectly honest world there would be absolutely no need for it. The fact that most of the media outlets lean heavily to the left should be so patently obvious to any intellectually honest person that a book In a different universe, a book like this one would never have been written. Not because it’s in any way false (it’s as far from it as it is intellectually possible), nor because its subject matter is uninteresting or boring. No, this kind of book ought not to have been written because in a perfectly honest world there would be absolutely no need for it. The fact that most of the media outlets lean heavily to the left should be so patently obvious to any intellectually honest person that a book like this one would be stacked in the bookstore between the book proving that the sky is blue and the one demonstrating the wetness of water. 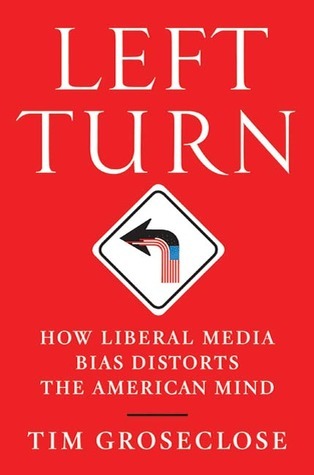 Unfortunately, we don’t live in a perfectly honest world, so there is a great need for a book like the “Left Turn” – a honest and rigorous analysis of the extent and the nature of the left wing bias in the media. There have been many other books dealing with this topics written over the past couple of decades, and each one of them had an interesting and insightful take on the topic of left wing media bias. However, what distinguishes the “Left Turn” is its scope, accuracy, and the academically accepted high standards of research. The author, Tim Groseclose, is a distinguished social scientist, and all the work upon which this book is based has previously appeared in high-level peer reviewed journals. This doesn’t necessarily mean that his work is free of error of any kind, but it significantly raises the bar for anyone who wants to have it dismissed out of hand. One of my favorite chapters in the book is the one in which Groseclose decides to try to visit a US city that leans to the right by an approximately same amount as the typical newsroom leans to the left. This is an almost impossible task, and he only approximately succeeds by visiting a small town in Utah, dominated by Mormons and settled by the southerners in the 19th century. Even so, the place is generally congenial to all of its residents (even the head of the local Democratic party) and a far cry from the shrill extreme left rhetoric and attitude that is found in most news sources these days. The final sections of the book discuss some really remarkable claims: were it not for the extreme media bias the US population as a whole would be tilting even more to the right. In other words, if all of the media outlets overnight decided to be perfectly “moderate” on all of their news coverage, they would still be substantially to the left of what most public would find to be the “natural” political leanings. This is indeed a very strong claim, and even though Groseclose provides some convincing arguments and evidence to substantiate it, it’s a topic that has really not been thoroughly researched. Overall this is a very readable and well-presented case for the existence and the extent of the left wing bias in the media. All conservatives who want to be well informed on this topic ought to read it, as well as all the fair-minded independents and liberals. This is by far the best book on this topic that I’ve come across, and one of my favorite overall popular social science books on any topic. Tim Groseclose's Left Turn pushes one main thesis: that news media outlets are overwhelmingly liberal, at least as liberalism is understood in American politics. Here's how he establishes the thesis. First, he identifies what would constitute liberalism, and he defines it in terms of what the liberal advocacy group Americans for Democratic Action (ADA) identifies as the set of key concerns for liberalism. The key concerns for the ADA are promoting unions, promoting pro-choice, opposing the Iraqi Tim Groseclose's Left Turn pushes one main thesis: that news media outlets are overwhelmingly liberal, at least as liberalism is understood in American politics. Here's how he establishes the thesis. First, he identifies what would constitute liberalism, and he defines it in terms of what the liberal advocacy group Americans for Democratic Action (ADA) identifies as the set of key concerns for liberalism. The key concerns for the ADA are promoting unions, promoting pro-choice, opposing the Iraqi war, among other issues. Next, Groseclose checks senators' votes against these key issues and then assigns them a political quotient (PQ). He arbitrarily, for convenience's sake, assigns the moderate position on the scale a 50.4. The next part might sound a bit hinky, and I don't know if I understood it myself, but here goes. To determine the media's slant quotient (SQ), Groseclose examined, across a sample year, specific news sources' citations of liberal, conservative or nonpartisan advocacy or watchdog groups, and he compared these citations to the senators' citations on the Senate floor. He tried to determine what proportion of citations one news source used relative to a given senator and was able, more or less, to correlate a given news source's SQ with a given senator's PQ. I think I've understood this correctly, and if I haven't, someone please correct me, and go slowly with me: I'm very simple. Basically, it seems, Groseclose determined media bias indirectly by checking it against the political orientation of American senators. What he finds after doing so is that most of the news sources have a liberal bias, and if one assumes also that this bias affects its audience then people become more liberal as a result of the exposure. Suppose that Groseclose's methodology is sound and that he has demonstrated a liberal media bias. If so, then he has demonstrated this bias according to what passes for liberalism in the United States and what is expressed along party lines as being in the scope of the Democratic Party. But I think the liberal-conservative spectrum in the US is far narrower than what would pass for a robust political spectrum in other parts of the world. Republican political consultant Mike Murphy in a recent podcast (The Dana Gould Hour, Dec. 19, 2012) said that in the US political system there are not in effect two parties, but instead there are two factions of what might be called the Business Party. Furthermore, the news presented could still be subject to often self-imposed restraint in view of making profitable news for advertisement and ownership and relying heavily on pre-packaged news sources like memoranda from Washington or from companies (often under the umbrella corporation of the news source itself) advocating or explaining a product (e.g.). News media outlets often no doubt placate people and special interest groups by promoting stories that would not contravene received opinion too much. And given that the frame has been so effective so far, the news media outlets can continue to interpret world events in terms of a War on Terror. Left Turn е книга, която определено заслужава огромно и дълго ревю, но няма да го получи тук, защото едва ли друг българин освен мен ще се навие да я прочете, каквото и да напиша за нея. Тим Гросклоуз се занимава с политическа статистика и Left Turn: How Liberal Media Bias Distorts the American Mind е просто хващащото окото заглавие на една общо взето научна книга, в която той публикува резултатите от седемгодишно изследване на медиите в САЩ и техните публикации и журналисти, което е част от рабо Left Turn е книга, която определено заслужава огромно и дълго ревю, но няма да го получи тук, защото едва ли друг българин освен мен ще се навие да я прочете, каквото и да напиша за нея. Та изследването на Тим Гросклоуз доказва нещо, което си беше очевидно за мен още откакто започнах да следя инцидентно публикации и предавания в NYT, Economist, WP, The Guardian, CNN и т.н. и да гледам холивудски филми след като почнах малко да се интересувам и разбирам от икономика и политика – а именно, че огромната част от статиите и предаванията са написани предубедено. И то предубедено в полза на политическото ляво. Не искам да звуча като привърженик на теория на конспирацията, но когато човек забележи тия неща, почва да ги вижда навсякъде. А Left Turn показва, че те наистина са навсякъде. Всъщност, това не е изненадващо – между 85 и 95, а на много места и над 97% от журналистите в американски медии са привърженици на Демократическата партия. Така изкривяванията на новините са както неволни (лошото на предразсъдъците е че този, който ги има, не ги осъзнава), така в много случаи и съвсем съзнателни. Демонизирането на политическото дясно и търпимостта към насилието на политическото ляво са очевадният резултат от тези тенденции. An amazing read, and one that everyone who consumes the new should read. Why? Because there are two competing views of the media in the US. one is that it is slanted (Left or Right depending upon one's particular politics), and the second is that the slant of the media has little to no effect on the average voter. the author takes on both of these issues head on and through a strong analysis of whether or not the news is biased and how much. Note, he does not analyze opinion pieces, but specific An amazing read, and one that everyone who consumes the new should read. Why? Because there are two competing views of the media in the US. one is that it is slanted (Left or Right depending upon one's particular politics), and the second is that the slant of the media has little to no effect on the average voter. the author takes on both of these issues head on and through a strong analysis of whether or not the news is biased and how much. Note, he does not analyze opinion pieces, but specifically news pieces. His results are quite astounding and prove quite handily that the media is not centrist but is rather slanted to the Left. He shows three independent methods used to determine media slant each of which show that the media is left leaning and then he talks about some of the reasons. This in itself would make the book worth reading and valuable, but he takes it another step. This is to look at the effect that the media slant has on voters. Once more using multiple research methods he calculates the effect that media has on changing voters opinions. This puts to end the idea that the media doesn't effect voters. So, in the end he shows that the media leans to the left, and that that the media actually changes voters opinions to the left as well. A a final experiment he uses some algebra to compute the stance that voters would have if the media and the average voter had the same views...that result is quite amazing with the average voter moving from about 50% to about 32%. I wish that the cover of this book included this: "(And I can prove it -- with Science!)" See, sometimes I wonder: When I find conservative political arguments convincing, is it only because I (usually) already believe the propositions, or is it because the arguments are factually and logically sound? Above everything, I am interested in the truth and reason; personal feeling and "agenda" come second (and hopefully are subject to what is true). Often, when considering a particular political or t I wish that the cover of this book included this: "(And I can prove it -- with Science!)" See, sometimes I wonder: When I find conservative political arguments convincing, is it only because I (usually) already believe the propositions, or is it because the arguments are factually and logically sound? Above everything, I am interested in the truth and reason; personal feeling and "agenda" come second (and hopefully are subject to what is true). Often, when considering a particular political or theological issue, I'll just wish that I could know what is absolutely true, whether it accords with my beliefs or not. Groseclose did not know that his huge 8 year research project would come to these conclusions. His concern was only to put the "science" into "political science", for once. This book painstakingly explains his thought process, how distortion theory works, how the political and slant quotients are computed, the several different ways bias was measured, and how this bias has actually affected the American public (Groseclose posits that, had it not been for the media, McCain would have beaten Obama soundly). He takes you through the equations and the graphs and the numbers. And throughout it all, Groseclose goes to great lengths to be generous with his conclusions. Of the numbers that his equations spit out, he uses the conservative results to compute bias (meaning that, if anything, he ends up understating liberal media bias). He is candid and straightforward and charitable when evaluating people's intentions. This book is incredibly even-handed. In the end, Groseclose proposes two measures which he thinks will help to remedy this disconnect between the media and the average American. First, he recommends that journalists spend more time around conservatives (he demonstrates early on that, overwhelmingly, they are currently exposed to very few actual conservatives). Second, he proposes that journalists state outright their political views (perhaps listing them on the network websites), which they currently guard like state secrets. In doing this, Groseclose says that journalists will be more like politicians -- with the latter, at least, you usually know where they stand and aren't suckered into believing they're truly unbiased. There are measures in place to ensure that politicians are accountable to their constituents, while there aren't any such measures to keep journalists honest. I was riveted by this book and amazed by how much work and time and effort must have gone into it over the years. I am grateful to Groseclose for that and believe he has made a significant contribution to political and social thought. That said, if anyone who happens to read this is aware of a worthwhile refutation of Groseclose's conclusions/methodology, then I would appreciate being linked. As I said, truth is my greatest concern. Also, if you are interested in computing your own Political Quotient (PQ - an estimation of your liberalness, or lack thereof), you can do so at Groseclose's website. A dispassionate layman's explanation of peer reviewed academic research on the bias of the media and its impact on the political views of the country. Books claiming a liberal bias in the media are hardly new. I've read several. What sets this book apart is its academic approach and the complete lack of an ax for the grinding. Groseclose lays out at the beginning exactly where he's going to take us in this book, and then does a reasonably entertaining job of explaining the scientific research tha A dispassionate layman's explanation of peer reviewed academic research on the bias of the media and its impact on the political views of the country. The title may be a little strong, but this book is a solid demonstration of the ideological slants of mainstream media relative to the average voter. It's not a surprise to anyone remotely familiar with the average national journalist and the average voter, but you'd be surprised how few people understand both groups. Groseclose is a true conservative - not a libertarian like myself, but a social and fiscal conservative - in a liberal field (academia) who is very good at showing the pernicious e The title may be a little strong, but this book is a solid demonstration of the ideological slants of mainstream media relative to the average voter. It's not a surprise to anyone remotely familiar with the average national journalist and the average voter, but you'd be surprised how few people understand both groups. Groseclose is a true conservative - not a libertarian like myself, but a social and fiscal conservative - in a liberal field (academia) who is very good at showing the pernicious effects of unstated ideology. Those are perhaps the most galling anecdotes in the book: journalists claiming that their strong and uniform ideology has no effect on their reporting. Wish that they were such angels, but they are not. Groseclose also quickly takes care of the usual objections to liberal media bias (corporate bosses are conservative! media just give people what they want! etc.) before measuring its effects. Groseclose provides evidence from elections that journalists (political correspondents, specifically) vote Democratic ~93% of the time, compared to 50% for the average voter. That makes the average journalist much more liberal than the average citizen of Massachussets, or even of Berkeley, CA. The empirical evidence of journalist bias is overwhelming, and the conversion of ideological leanings onto a numerical scale is helpful in comparing magnitude of bias (although Groseclose treats the numbers as more precise than they are - there's a big error margin around his estimates). The best parts of the book take individual stories and show how reporters can put together a biased story using only true facts - by choosing the topic, the facts to show (and hide) and the experts to cite (or omit). Thus, a story of entirely true facts can tell you that the number of black students at UCLA is falling (when it is not) or that the Bush tax cuts are regressive (they were not). Of course, the audience doesn't know what's being omitted, so they have no way to compensate for these choices. A similar omnipresent journalistic tactic is the insertion of qualifiers for anything that is conservative while omitting the same from liberal equivalents. You are told that someone is "the conservative regent" but not "the liberal dean" - she's just "the dean." Conservative viewpoints tend to get a "so-called" or "what critics call" prefix, while liberal viewpoints don't. And now that you're aware of this, you won't be able to unsee it wherever you look. The last quarter of the book is a little more speculative, purporting to show what the average American voter would be like if the information she had access to were undistorted. (Answer: Kansas.) The methodology here is a little less reliable, assuming linearities where that's not necessarily warranted, but it's hard to disagree with the conclusion that the average voter would be even more conservative if media were less biased. Recommended, with the aforementioned error bars around precise measurements. The NY Times, in a story defending Neil DeGrasse Tyson's fabrication of quotes, fails to mention that writers at The Federalist first pointed out the fabrication. The NY Times again, uses this headline for an article about the exoneration of New Jersey governor Chris Christie in the Bridgegate scandal: Report Cites Gaps Between Records and Christie’s Comments on Bridge Lane Closings. Remember: Christie was cleared. Very interesting study! The book is very well laid out and the data is presented well. Clearly the results are going to be more palatable to the politically conservative, but I think everyone who reads this will find useful information, regardless of political persuasion. The numbers and conclusions about the amount of liberal-leaning people in the media is very convincing. 93% supporting Democratic candidates is a huge tilt! The supporting information showing how this impacts media bias is convi Very interesting study! The book is very well laid out and the data is presented well. Clearly the results are going to be more palatable to the politically conservative, but I think everyone who reads this will find useful information, regardless of political persuasion. The numbers and conclusions about the amount of liberal-leaning people in the media is very convincing. 93% supporting Democratic candidates is a huge tilt! The supporting information showing how this impacts media bias is convincing as well. The overall argument is that the majority of the media is not intentionally biased, but that the bias is there nonetheless, and the data presented certainly seems to support this. The only major conclusion reached in the book that I'm not sure I agree with is what a "no media bias" America would look like. The logical argument is well laid out as it relates to the media bias, but I think there may be some additional factors not taken into consideration. Media bias isn't the only factor in the movement of voters on the liberal/conservative continuum. A great read that gives hope to a closet-conservative or anyone else who thinks the country as a whole too liberal and past the point of no return. Groseclose provides some solid scientific analysis in Freakonomics style to show that political preference and bias can be quantified, that the media's preference is wildly liberal, that this has an affect on their reporting, and that this does in turn affect the populace's political preference. I was pleased to find out that on a scale of 0 to 100, A great read that gives hope to a closet-conservative or anyone else who thinks the country as a whole too liberal and past the point of no return. Groseclose provides some solid scientific analysis in Freakonomics style to show that political preference and bias can be quantified, that the media's preference is wildly liberal, that this has an affect on their reporting, and that this does in turn affect the populace's political preference. I was pleased to find out that on a scale of 0 to 100, the average voter in the United States is a 50 moderate. I was even more pleased to find out that, according to his research and reasoning, the average voter in the United States would be more like a 25-30 on that same scale, if the media didn't have a bias. I've read excerpts, and I can tell you the methodology is simply wrong. The author starts with arbitrary "left" and "right" points that don't come close to reflecting the complexity of political thought. He does not account for "right" and "wrong" -- or "correct" and "incorrect." Stephen Colbert may be joking when he says "the facts have a liberal bias," but we are living in an era in which the leading cable "news" network encourages birtherism and couldn't come to grips with Romney being behind I've read excerpts, and I can tell you the methodology is simply wrong. The author starts with arbitrary "left" and "right" points that don't come close to reflecting the complexity of political thought. He does not account for "right" and "wrong" -- or "correct" and "incorrect." Stephen Colbert may be joking when he says "the facts have a liberal bias," but we are living in an era in which the leading cable "news" network encourages birtherism and couldn't come to grips with Romney being behind in the polls. In Groseclove's methodology, such incorrect reporting and analysis would be "right." Are the media biased? (Note plural.) Yes, in many different ways, some that can be expressed on a political spectrum and some that can't. But be very suspicious of people who use such simplistic tags and then run "studies" that confirm their own biases. They're trying to make you believe things about journalists that simply aren't true. And their motivations for lying are far more compelling than a journalist's. The idea of the media having a decidedly liberal bias isn't (or shouldn't be) news. The problem has been the lack of real ability to prove it in anything resembling an objective way. Groseclose, a professor at UCLA, has some pretty significant success in doing so, creating an algorithm that is able to not only chart where the American center sits, but where people and media outlets sit in comparison to it. A very worthy book to try and dive into the issue, even if it's imperfect. Massive amount of information but presented in an organized fashion. Nice to have the statistics to back up what so many of us have thought for years but now have a "source" to refer to when arguing that the media is biased towards the left. Highly recommend if you are interested in this topic. Even if you are left-leaning, give it an objective read. The facts can't be disputed. Uma investigação corajosa e brilhante sobre o viés ideológico da imprensa, indispensável para quem se interessa pelo tema. This is an important book if you care about the irresponsible reporting of the news media in America. This proves with data and research that the news is extremely biased towards the left. Even though this book was published in 2011 it is still relevant. There were a few sections of the book where the author goes deep into the data and research to explain his methodology and conclusions. He counterbalances this with some very good plain English 'thought experiments' to put difficult concepts int This is an important book if you care about the irresponsible reporting of the news media in America. This proves with data and research that the news is extremely biased towards the left. This isn't the first book I've read on this topic, but his arguments were probably the most persuasive. One main reason is that they are backed up with peer-reviewed research by himself and others. Groseclose does an excellent job at showing how bias exists and how one might recognize it when comparing news sources. The book is well-written and engaging, and I would certainly recommend it. This book was exceeding my expectations and I was thinking of giving it 5 stars, but the final section on th This isn't the first book I've read on this topic, but his arguments were probably the most persuasive. One main reason is that they are backed up with peer-reviewed research by himself and others. Groseclose does an excellent job at showing how bias exists and how one might recognize it when comparing news sources. The book is well-written and engaging, and I would certainly recommend it. This book was exceeding my expectations and I was thinking of giving it 5 stars, but the final section on the effects of media bias was much weaker, so I dropped it a notch. The analysis in the final section is primarily based on a number for the media effect ("media lambda") that he essentially pulled out of a hat. Claims about how the nation would vote in the absence of a biased media were interesting but were also hard to support. He does show that even over a range of possible values for this parameter the effect of bias is rather large, and I can accept that point. But to pinpoint an exact value representing how much the media affects public opinion is a little much. I think it would probably be wise for him to investigate the bias in other parts of the media outside of just the hard news. He explicitly ignored the opinion and editorial sections of newspapers and the opinion shows on television when computing his numbers. These are other parts of the media, which admittedly usually claim less objectivity, but which also affect public opinion. These effects should be considered if he wants to make larger statements about the impact of the media on voters. I also think he should consider using a 2-axis scale for political beliefs, instead of mapping everything to a single scale. This might help to show how bias differs in economic vs. social issues, and would avoid confusion that inevitably occurs when mapping certain opinions to a single axis. Whew! It's tough to be non-bias isn't it? I think Tim Groseclose does as good a job as I try to do when talking about the issues. That being said the first 200 pages of this book are great and exactly what I expected. However, Tim takes it a step further and actually PROVES his work. The proof is a bit dry and full of real math and real examples to back up what he is talking about. However, I found myself bored with the last 100 pages and skimmed through his proofs. Most people who pick up this Whew! It's tough to be non-bias isn't it? I think Tim Groseclose does as good a job as I try to do when talking about the issues. That being said the first 200 pages of this book are great and exactly what I expected. However, Tim takes it a step further and actually PROVES his work. The proof is a bit dry and full of real math and real examples to back up what he is talking about. However, I found myself bored with the last 100 pages and skimmed through his proofs. Most people who pick up this book are not really looking for the science behind it all. I didn't expect it to read like a College Dissertation. I think Groseclose chose to do it this way. Because he knows that the people who want to read a book like this are probably conservatives who already have a "Feeling" that the media is left bias. I just didn't know how much! This book continues to amaze me the more time that passes since I've read it. The impact it has had on me and knowledge it has provided has really altered my outlook on the media and what we are all being fed by them on a daily basis. I feel much more armed against the nonsense and have a deeper understanding of how very possible it is to be told the truth on all news stations, yet have a completely different emotion or action evoked by those truths which are often not explained and left in a si This book continues to amaze me the more time that passes since I've read it. The impact it has had on me and knowledge it has provided has really altered my outlook on the media and what we are all being fed by them on a daily basis. I feel much more armed against the nonsense and have a deeper understanding of how very possible it is to be told the truth on all news stations, yet have a completely different emotion or action evoked by those truths which are often not explained and left in a simplistic form that doesn't adequately represent what is actually happening. Tim translates his peer-reviewed (and so far, unchallenged) research on the matter for laymen. He gets a little bogged down in statistical arcana towards the end of the book, but overall, it is an excellent treatise on what we've known all along: that most media are biased towards the left, and it affects tge mindset of the nation. Didn't quite finish it, but it was due back at the library. Interesting topic, very well explained and supported. Surprisingly interesting, given the topic. I recommend it, but it's not one of those books you stay up too late reading saying to yourself, just one more chapter and then I'll go to bed. This was a fascinating book that I believe every person needs to read. It was very insightful and I would say it was very un-biased. It really does give you a way to actually look at and see the bias that the media has, and the bias that everyone has as a result. I recommend it to everyone. needed a book for a book review for my Media & US Politics class. This fits the bill. Lots of math, lots of thought experiments and a little dry at times. However, it does lay out the evidence of left-leaning media bias. A remarkably thorough analysis of media bias, with full disclosure on the methodology used. Everyone should read this book, no matter your political leanings.